The ICWRGC hosts, operates and maintains the Global Water Quality database and information system GEMStat, within the framework of the Global Environment Monitoring System for Water (GEMS/Water), and in cooperation with the Federal Institute of Hydrology. The GEMS/Water programme was founded as a global network for water quality monitoring under the auspices of the United Nations Environment Programme (UN Environment) in 1978 and involves the World Health Organisation (WHO), the World Meteorological Organisation (WMO) and UNESCO. Countries and organisations voluntarily provide water quality data from their own monitoring networks. The water quality data available in GEMStat can be used for status evaluation, policy-making, research purposes or within the scope of education and training initiatives. At present, the growing database contains more than 4 million entries for rivers, lakes, reservoirs, wetlands and groundwater systems from 75 countries and approximately 4000 stations. Overall, data is available for the time period from 1965 to 2017 and about 250 parameters. Here, users can inform themselves in more detail on GEMStat and the GEMS/Water programme as well as obtain background information on data availability, user statistics and the growth of the database. Data products recently developed include among others an interactive data explorer to visualise station, country and catchment statistics, interactive maps on SDG 6.3.2 core parameters, statistical reports on station, country or catchment level and an interactive metadata catalogue to access information on monitoring programmes and stations. Established in 2001, GTN-H is a federated network of major global data centres, at a global scale linking water-related observations in support of scientific advance and operational applications with regard to climate variability and change as well as water resources assessment and management. The GTN-H is a joint project of the World Meteorological Organization / Climate and Water Department and the Global Climate Observing System (GCOS). 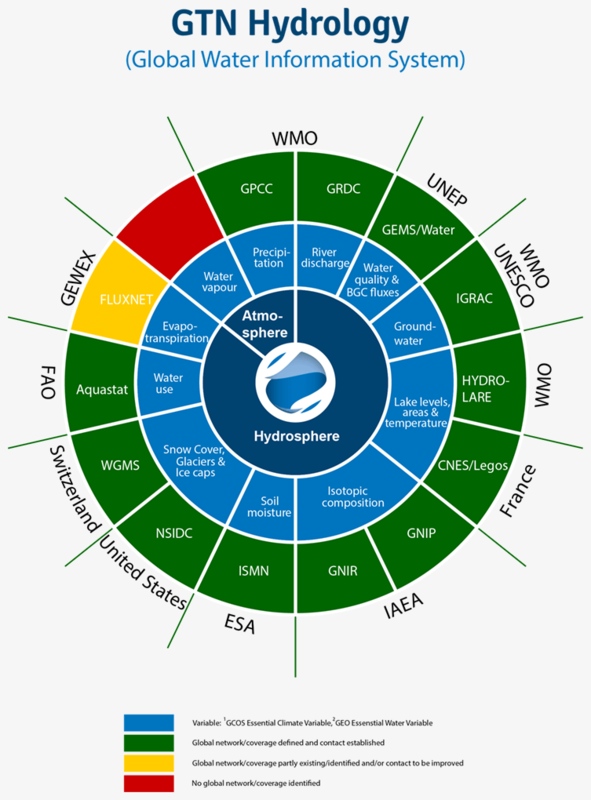 GTN-H likewise represents the observational arm of the Group on Earth Observations / Integrated Global Water Cycle Observations Community of Practice (GEO/IGWCO-CoP). Through its federated network of collaborating global data centres, GTN-H provides premier access to data and information including – inter alia – runoff, lakes and reservoirs, precipitation, groundwater, soil moisture, and water quality or the content of hydrogen and oxygen isotopes in rivers and precipitation. GTN-H supports the development of integrated products to enhance the value of data by means of integration and by facilitating solutions to complex science and applications products. GTN-H is active in supporting current and emerging technologies and standards, best practices and available infrastructure and develops global and regional data products. A list of the GTN-H network members can be found at www.gtn-h.info.